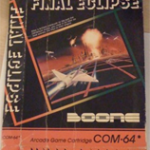 Final Eclipse was to be a 3D space shooter published by a company called Boone in 1983. The game was being coded by Rebecca Ann Heineman at the time and it is believed the game was coming on well. The game was based on an ongoing saga of Captain Brian Fargo and how he saved the Earth from being a block of ice. Rebecca’s work consisted of a tech demo where it faked 3D, where you would fly a ship over terrain that was a grid that moved in 3D. The camera could not turn, it could only move forward, backward, left strafe and right strafe. The grid would move in perfect 3D – however since Rebecca could not turn the camera, there was no option to calculate rotation – which was how Rebecca did image rendering on the Vic 20. Sadly the game was never to be as Boone go into market and internal problems in 1983, and everyone was sadly laid off. The company suspended operations as a result, and a group of Boone programmers led by Brian Fargo went on to form Interplay. Final Eclipse was caught up in the storm as a result and was never finished. Although Rebecca had the box from the game, sadly it was only the box that Rebecca had kept and the game is now long gone. It will require a miraculous finding to ever see anything of the game.